Andy Batt‘s approach to photography is built out of a strong commitment to creating an intersection of image and story. Whether it’s working on a large scale project with a huge crew and bigger personalities, or a quiet portrait session in his own studio, his work shows a love for the act of discovery and the creativity of crafting with light. In 2013 Andy began working with a new high-profile client, Verizon, to photograph their iconic IndyCars and the drivers who operate them. While shooting, Andy found himself visiting various different racetracks, mounting cameras onto cars, and using remote-controlled helicopters all in the name of telling the Verizon IndyCar story. We sat down with him recently to get all the details on what goes into capturing the raw power of these automobiles, what the shoot days were like, the scariest moments, and to get a glimpse of what we can expect to see from him in the future. The images below are selected pieces from the series. View the complete project here. Andy: Art buyer Hillary Frileck put my name in the hat and creative director Cliff Skeete believed in me. They are amazing people to work with who love and understand photography and its importance in advertising. 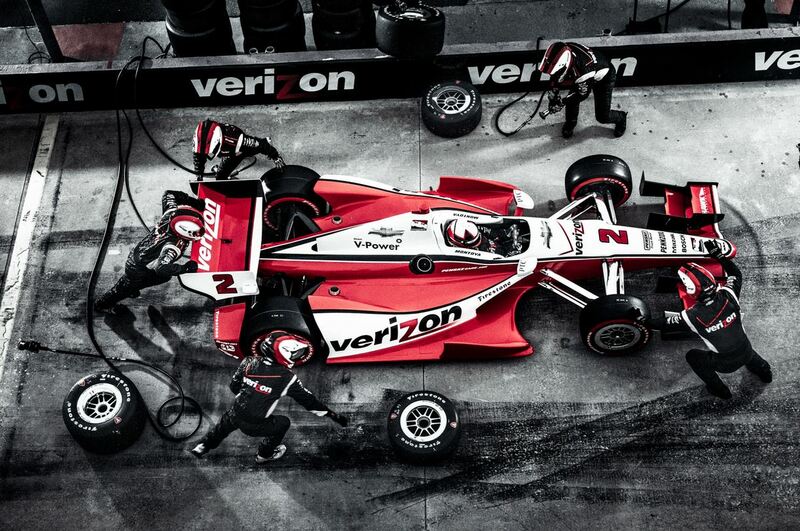 We’ve worked on four amazing rounds of Verizon IndyCar — two multi-day shoots at a track we had locked down, and two different racetracks capturing real racing in a way that matched our production shoot. What was your strategy for photographing these cars and their drivers? I needed to deliver and create images that would resonate and create that story with a fan. IndyCar is an exciting sport—it’s about the scale of the track, hearing the engines roar and feeling the immense speed as those cars dive into a corner. Putting that into a series of images was the good kind of hard creative work. What were shoot days like and what kind of challenges did you face? Andy: We had half a day of testing and two shooting days to work on the first round of this project, and two more days for the second round. The days were long — sunrise to sunset. Were there any scary experiences? Andy: Nothing felt that scary — for me. For the people watching I think there were a few moments of fear seeing me flying around the track like a lunatic. There was a brief panicky moment when I was sitting on the “front porch” of the insert car, behind the IndyCars going around the track at 70mph when I became aware of just how crazy this was, but I was able to shut that down and get on with the shooting. It’s true that looking through a camera makes you feel protected somehow. There is something about working through crazy stuff that lets you just ignore the ramifications. I would like to add that the insert car operator was amazing, and had me strapped in very safely. What was post-production and editing like for this project? Andy: The post look was a collaboration between myself, the agency and my retoucher. The call was to take the images into a dark, gritty and aggressive place. If you look at lot of the marketing for other IndyCar teams, you’ll find a very slick, polished look—almost video game like—and with this campaign we wanted to go away from that. There’s a great boutique retouching agency in Portland—Willamette Valley Color. I work directly with the owner, Craig Ferroggiaro on most of my projects. On IndyCar Craig was indispensable, helping craft the look we wanted. Do you have a personal favorite image from the series? Andy: I really love this image from the first round; it’s from one of the cameras we mounted right over the front wheel with a super wide lens.There’s a real sense of the speeds these cars are capable of and the light is amazing. It’s a shot that, for me, fulfills the mission of creating a new image for this sport. From the second round, this pit stop photo is one of my favorites. We brought a genie lift out to the track so I could shoot hand held from directly above the car. There were a bank of strobes positioned up high as stadium lights to add some of the flavor of a night race. What would you say is unique about your photographic approach and what do you think sets you apart from other photographers? Andy: That’s one of those difficult questions for me. From my perspective, I throw myself into a project like this one full force. All the choices I make seem like the obvious ones — I do what seems right. It’s hard to see outside of that bubble. When I talk to other photographers or clients, I get the sense that the paths I take, and the way I do things is unique. But from the inside? It’s hard to know. I have to answer the same questions as everyone else. What story am I telling? Whose story is it—clients, subjects or mine? How do I tell it in an interesting way? I try to make the answers my own—the game is to create original photographs that have some special sauce. Not that everything is a complicated, complex idea—sometimes it’s just about getting the right smile on someone’s face. A project like IndyCar is literally a lot of moving parts; it’s about creating a palpable sense of exhilaration and excitement. Where do you see your photography going? What can we expect to see from you in the future? Andy: My photography is always in a constant state of evolution—it’s easy to look backwards and see where I’ve been, but much harder to look forwards. I just know that when I find myself repeating things, I get a little itchy to make a change. That could mean discovering a new technique or finding new subjects, I’m not sure. For me it also means looking at current styles and trying to see either past them to what’s coming, or looking closer at what’s 180° from them. I tend to steer away from the current trends—I’ll take advantage of them when appropriate, but if I’m trying to move my artistic self forward, it’s about doing what others are not. That means that what I’m doing might not always align with current tastes, but hopefully I’m always ending up in a slightly different place than everyone else. Do you have any words of advice for emerging photographers? Andy: Well, I guess the baseline would be to believe in the paradox. This entire industry rests on the ability to hold two alternate concepts of the same idea in your head at the same time. For example, being a small business owner means that it’s necessary to be profitable — that’s not a luxury — and you need to minimize financial risk. On the other hand to pursue the career of an artist means it’s necessary to take risks. Sometimes those are creative risks, but often it’s linked to taking a financial one. Being an artist is all about vision and creative ideas, and sometimes you need to follow that vision with money. To be both of those things is paradoxical, but being a successful commercial photographer requires both. You need to create work that satisfies your soul, that makes you happy and inspired. You also need to create work that satisfies your clients, that puts money in your pocket. If you are very lucky, you can get paid to do the work that you love. Most of the time you need to find both kinds of work so you can feed your soul and your body. Too much of the work that just gets you paid, but doesn’t feed the artist means you’ll wake up one day with no desire to do the work you need to keep doing. Too much work done purely for your artistic vision, with no financial return means you’ll run out of money. Finding balance in what you do is incredibly important. For a deeper look into Andy Batt’s body of work please visit his AtEdge Portfolio and Website.